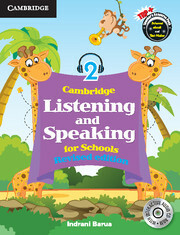 Cambridge Listening and Speaking for Schools, is a ten-level series that prepares for ASL. Cambridge School Grammar series (1–8) takes a holistic view towards the development of the school learners’ knowledge of English grammar. The course aims to teach English grammar with equal emphasis on the form and the communicative function of each grammatical structure. 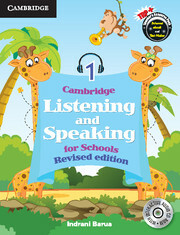 Every unit introduces learners to one grammatical structure through meaningful contexts and provides ample practice, and demonstrate the use of the structure for specific purposes in real-life scenarios. 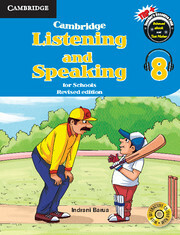 Since grammar plays an important role in the development of the basic skills of LSRW, the tasks in every unit integrate grammar with the skills. 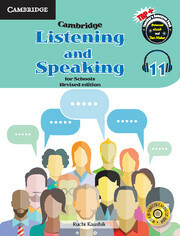 Assessment of Speaking and Listening Units—Tasks modelled on the CBSE guidelines for Assessment of Speaking and Listening (ASL). Vocabulary—Tasks helping to build discrete and level-appropriate vocabulary among non-native speakers of English. Breakout! (Levels 4 to 11)—Engrossing activities and problem-solving tasks after every chapter to make skill building collaborative, communicative and fun. Learner-friendly visuals and layout—An exciting mix of real images and illustrations. Teacher’s Resource Pack+ —A digital solution for classrooms delivered via DVD-ROM packaged with the Teacher’s Manual. Student Audio CD—Audio CDs with recordings in Received Pronunciation, ensuring exposure to internationally spoken English. 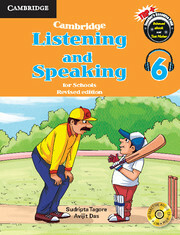 The course prepares its users for the Assessment of Speaking and Listening (ASL) Skills conducted by the CBSE as part of Summative Assessment I and Summative Assessment II.